Most of us are fascinated by the overall anatomy of the Octopus. Well known for a very large head and eight arms, it is able to move around the water with speed and grace. As it moves the eight arms move along behind it. When one of the arms is lost due to injury it can grow a replacement in very little time. Many people are dumbfounded to see an Octopus fit into spaces that are way to small for their bodies. This is possible due to the fact that they don’t have any skeleton to them. They find these place to hide from predators and to remain undetected in the water. The head of an Octopus is very large. They have a very hard beak on the mouth which you have to look very carefully at the head to find due to the fact that it blends in so well. Each of the eight arms have small suction cups on the ends of them. 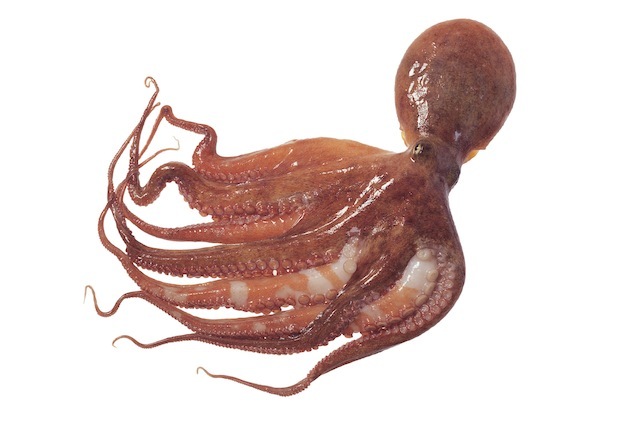 If you were to cut the body of an Octopus in half, it would be perfectly symmetrical on both sides. Most people don’t know it, but they Octopus has three hearts. They have one that pumps blood through the gills for each side of the body. The third one is responsible for pumping the blood through the rest of the body. You may not notice unless you take a very good look at the body of these creatures that they have gills. This organ helps them with breathing as water is circulated through them. The foods that the Octopus consume go through a very interesting process. They have to be in bite sized pieces to go through the esophagus. From there they go into the brain and then routed through the digestive tract and into the stomach. The crop is a sac where the food is temporarily stored before it enters that digestive tract. They have a special type of gland in the body that triggers the digestion process. Another gland that they have is to create and hold their venom. That is what they inject into their prey to immobilize it. Without this process they would have a hard time getting their prey to be still. They rely upon their powerful beak to be able to break the shells of their prey. When they can’t, they have a very powerful sucking ability to take it out of the shell. The nervous system for an Octopus is controlled by the brain, and it is very complex in nature. What is very interesting is that they don’t have any organs for hearing. The Octopus is an animal that is deaf. They have a sac where they ink is produced when they need to release it and escape from danger. There is actually a gland in the body that creates it. The amount of ink depends on the species of Octopus and the overall size of it. There are several different types of movement that the Octopus is able to enjoy due to the their overall anatomy. They are often seen walking around at a leisurely pace. They can also crawl by bending the arms at different angles. They will swim rapidly to avoid danger or to be able to capture their own prey. They also have jet propulsion when they need to flee due to impending dangers so they can go extremely fast. The vision for an Octopus is very good and they use it to help them move around in the water. They also rely upon their sight to keep a good look out for various types of predators.